First of all, the illustrations on this book were fabulous and the way they conveyed Fakruddin’s expressions were hilarious. 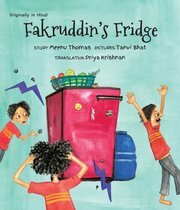 I loved how Fakruddin thought out of the box and achieved a solution so logically. I would certainly recommend this book to my friends as it was hilarious. It is a silly but funny story . Fakru reminders me of shek chilly and how he used to day dream , fakru worries and he thinks about all good things.